Are you planning a cruise? My family LOVES cruises. One reason we love to cruise is the unique opportunities at each cruise port. If you are like me, there is one special vacation experience you love to talk about. 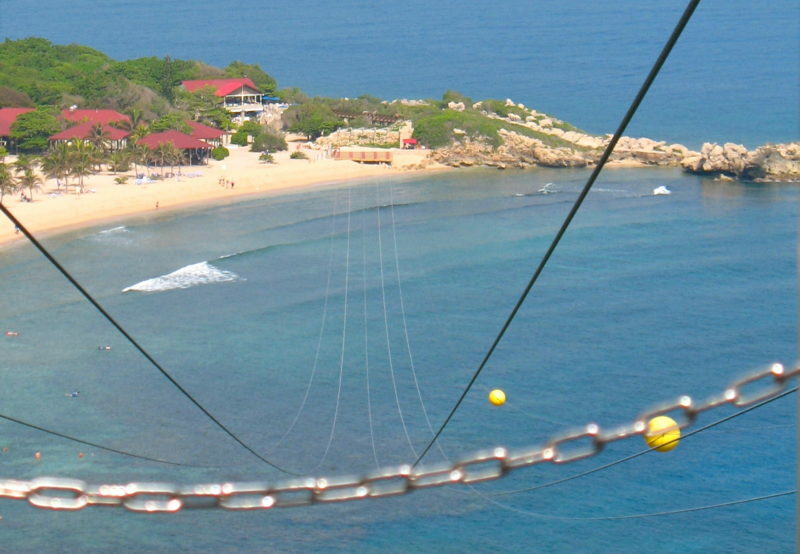 Mine is the Dragon’s Breath Flight zip line in Labadee, Haiti. Dragon’s Breath is the world’s longest over water zip line and can only be experienced if you cruise with Royal Caribbean to their private island of Labadee. This zip line is unlike any other zip line excursion I have done. From a platform 500 feet above the beach you will zip down 2600 feet care free over the water at a high speed to the beautiful land below while soaking in the view of your ship and the island. Here are a few tips that will help you take full advantage of this exhilarating excursion. You will be given lots of instructions before taking flight. Safety rules are given as you get harnessed up. Next is a practice run on the low height zip line where you will be shown how to brake. Then you have your final launch directions on the top platform telling you how to reach high speeds. Make sure you listen carefully at each spot to ensure you have a smooth flight. Make sure to bring a GoPro or other camera with a secure strap if you want photos from the top. You are allowed to video and take photos on the excursion. In order to take photos you must secure the camera on your wrist with a strap. If all you have is your smart phone for photos you will need to lock it up in the island locker rentals. Here’s a video of my first time on the Labadee Zip Line. By getting on one of the morning flights you will have plenty of time to explore all the activities (there are a lot of options) on the island without feeling rushed to get to your tour. There is a practice line that helps get you comfortable with the harness, the seated position and braking. Being able to practice before the real thing can calm you down and give you feelings of being prepared. Just focus straight ahead at the top platform. They will hook you up to wires the moment you step on the platform. Once it is your turn, you will be harnessed into your lane and the time of your life will begin! Want more tips for making the most of your day on Labadee? Click the Next button below to read about Allison’s experience at this fun Royal Caribbean port. Where: This excursion is only available through Royal Caribbean because it is located on their private island of Labadee in Haiti. When: Available on any Royal Caribbean cruise that stops at Labadee. How Much: Prices start at $99 per person. Restrictions: Must be a minimum of 48 inches tall with a minimum weight of 75 pounds and not exceeding 275 pounds. How Long: The excursion takes approximately 1 hour but you have all day to enjoy the island before or after your zip line adventure. We are proud to partner with Get Away Today Vacations for family cruises. Get Away Today is a family-owned company with 25 years of cruise travel experience and a commitment to customer service. You’ll never pay booking or agency fees for a cruise at Get Away Today. When you call to book your cruise, tell your Get Away Today agent that Tips for Family Trips sent you. They’ll add $25 shipboard credit to your account! How long is it 5mile or more?